Optical Crystal Star Column, 7in, Supplied Boxed. 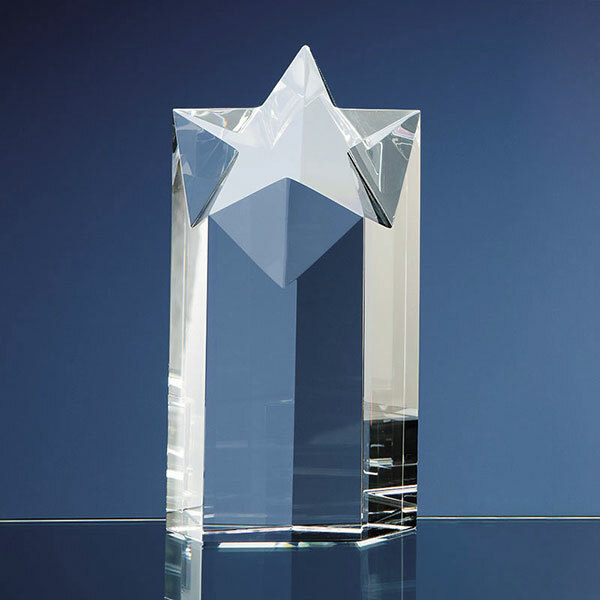 Optical crystal award in star shape column design, 7in tall and offered with text and logo engraving options. Colour print option available. Optional base. Supplied presentation boxed. A striking crystal award that would grace any presentation ceremony, from corporate awards to sports trophies to industry prizes. Handcrafted in flawless optical crystal, these awards feature a star design cut into a solid crystal block with a diagonal plane at the top. The optical crystal material refracts light as it passes through, ensuring a constantly changing aspect. These awards stand 7in tall. An optional clear optical crystal base, in rectangular shape, is available (priced separately). The column awards are offered here with engraving and/or colour print options, perfect for customising your star awards with event or achievement details. Each award is supplied in a foam-lined black presentation box.